ACTION to slow the march of weeds down travelling stock routes (TSRs) in the northern areas of the Northern Tablelands has been given a $99,600 boost by the NSW Government. Announcing the funding today, Northern Tablelands MP Adam Marshall said that unmanaged, TSRs can become highways for invasive weeds. “This grant from the NSW Environmental Trust will help Northern Tablelands Local Land Services (LLS) better understand the spread of weeds like Coolatai grass and African Lovegrass and help them with practical actions to halt that advance,” Mr Marshall said. 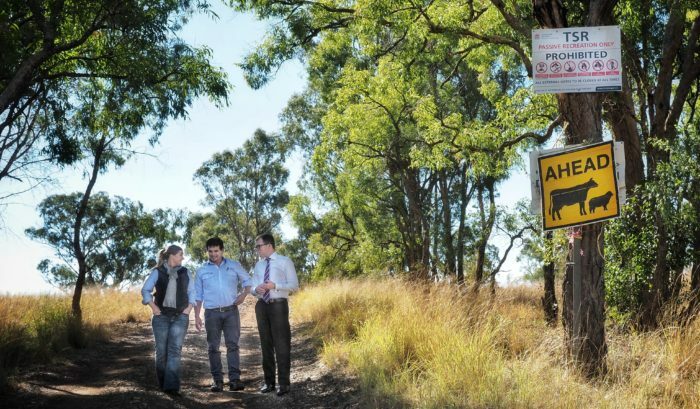 “Landholders have been fighting a long battle against these and other highly invasive species, with varying results. “TSRs themselves are also valuable farmlands corridors for native species. “Keeping those corridors open was an important reason for the LLS to seek funding from the government. Mr Marshall said that by preventing invasive grasses from displacing native grasses, the LLS aims to conserve the habitat of threatened species like the Bluegrass, Lobed Bluegrass and Five-Clawed Worm skinks, and the Border Thick-Tailed Gecko. Emphasis will be placed on controlling weeds in TSR’s of high conservation value within the Northern Tablelands.